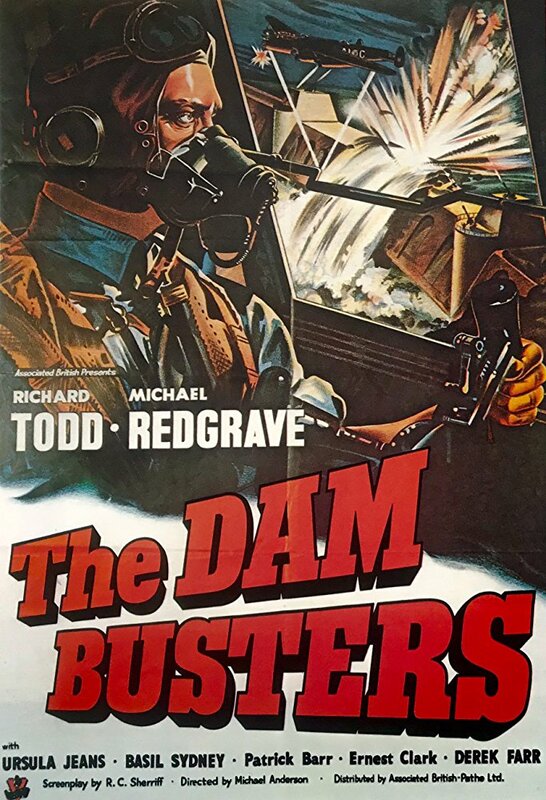 The Dam Busters chronicles the story of 617 Squadron, a group of very young airmen that were the best of the best…handpicked with the mission, to breach four of Germany’s dams on tributaries of the Ruhr River, thereby crippling industrial war output. Aircrews came from Canada, Britain, Australia and New Zealand. The modified Lancaster bombers, had to fly below radar detection and drop a specially designed skip-bomb at 60 feet, flying at 240 miles an hour and at a designated distance from the target. All this without highly sophisticated present day navigational aids. The movie looks at the development of the specialized skip-bomb by British inventor, scientist and engineer Barnes-Wallis, his efforts to convince a thick-headed air ministry his invention had merit. Along with that, the motion picture shows the formation and training of 617 Squadron under the leadership of Wing Commander Guy Gibson and ultimately the mission itself, flown on May 16/17 1943. Of the 133 young men on that mission, 31 were Canadian. Of the 19 aircraft that took part, 8 were shot down, 53 men lost their lives, 14 of them were Canadian. Naval personnel from the auxiliary anti-aircraft ship H.M.C.S. PRINCE ROBERT visiting liberated Canadian prisoners-of-war at Shamshuipo Camp, Hong Kong, September 1945.